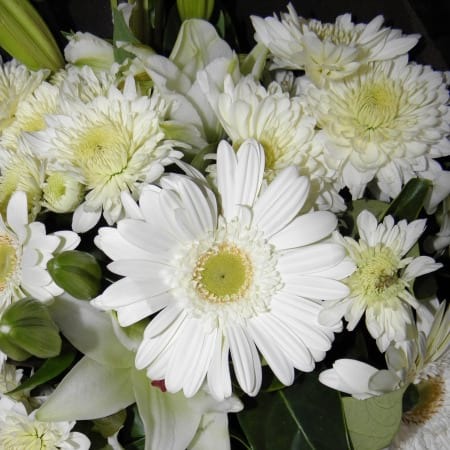 Amaranthine Flowers By Design offers you this stunning Harrison bouquet in white, with long lasting lilies, white gerbers, berries in fabric wrap. A crisp bouquet will look gorgeous, adding a special touch to any room and make a fabulous gift to friends, family or for that new born arrival to say congratulations, thinking of you or just because. The Amaranthine Flowers By Design bouquets are a beautiful way to say it all. Created by Amaranthine Flowers By Design, New Lambton Newcastle and delivered in a convenient temporary vase. Same day delivery available, six days a week, to all areas of Newcastle and Lake Macquarie, including John Hunter Hospital, Newcastle Private Hospital, Charlestown Square, Lake Macquarie Private Hospital, and Mater Hospital.